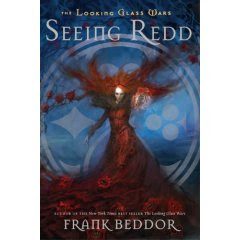 As mentioned last week, I dove headfirst into Seeing Redd, the sequel to The Looking Glass Wars (linked to thoughts), because it was so interesting and exciting that I wanted to keep the story going. I have read Seeing Redd before but it has been a few years. When I reviewed The Looking Glass Wars back in 2007 I pretty much only used exclamation points when talking about it. Seeing Redd was quite a different matter. I didn't care for it as much and I gave a pretty good set of reasons as to why. Fast forward to 2016 and all I remembered about the story was that I had some hesitations which caused me never to chase after the third book in the trilogy, ArchEnemy. This time my reading of Seeing Redd was completely different. I think perhaps the reason I could relax more with was because I didn't expect much from it, while the first time I engaged with high expectations. This story picks up right where The Looking Glass Wars left off, with Redd throwing herself into earth, experiencing some time away from Wonderland in the world as we know it. She amasses an army of dark characters in our world, intending to take them back to Wonderland for the purpose of reclaiming the throne from her pesky niece, Alyss Heart. The entirety of this book focuses on Redd's attempt to reclaim the crown and Alyss re-intregration into a Wonderland world. Throw in a side plot with Hatter Madigan and there is plenty of action, mystery, and intrigue to keep the story afloat. One of my original complaints about Seeing Redd was that it felt that Beddor was writing more in the interest of creating a screen play than he was in telling a unique story. I think that criticism still holds true. I also said that the book made me picture X-Men in my mind's eye as I was imagining what the characters looked and acted like and I found it somewhat amusing that the first reviewer Amazon lists lobs the same complaint in Beddor's direction. Apparently I am not alone in thinking that Beddor is more about the movie than the book. I did some online sleuthing to see if anything ever came of the movie idea and it would seem that while Beddor would have loved it, the success of Tim Burton's Alice in Wonderland probably means that The Looking Glass Wars will never make it to the big screen as the storyline shares some similarities. Beddor does still hope for a television series though and I suppose that's not too far fetched. Still, as a reader, I want to be told a story for the sheer enjoyment of story and not because someone is hoping to make it big in Hollywood. The pleasure is in the telling and the hearing first and it bothers me still that Beddor focuses so much on the visual aspect of his tale. That aside, I did enjoy Seeing Redd this time around. I didn't care much for Redd's excursion in our world. She's just too sadistic and nasty and when you pair her up with "bad guys" as we might know them, I found her doubly creepy. She's bad enough in Wonderland but on earth she's terrifying to the extreme! Once she makes her way back into Wonderland I find things much more tolerable. Conservative readers should know she meets up with some nasty characters on earth who delight in killing people. Just like in The Looking Glass Wars, Beddor doesn't skimp on battle details although I didn't think there was anything grosser than the last book's decapitations. (Truly, this is a story better left on the page in my opinion. I wouldn't want to see it played out on the screen.) Do be prepared for violence but, again, it's on the level of The Lord of the Rings. If you can handle that, you can handle this. Seeing Redd does have more mature elements in it which I mentioned in my 2007 review. There is nothing explicit in the least but there are romantic relationships which are beginning to bud and some which are being remembered. Due to that factor, I will absolutely delay handing this book over to my 9 year old. He can wait a few years. The great thing, as I've mentioned previously, is that The Looking Glass Wars really can stand alone as its own book. There's no absolute need to read on in the series if you don't want to or feel you aren't ready for it. As for me, I'm bound and determined to get through the series this time. I feel a bit entrenched in it and so ordered ArchEnemy for my Kindle. We shall see how that pans out. I'll let you know!